Today my engine started pinging. I hear it when I'm going uphill or if I accelerate after it shifts into 3rd or OD. I do have to be driving under 40 to actually be able to hear it over the road noise, so it's not that loud. Other posts have said to check the knock sensor. Is there a way to check it with a multimeter? 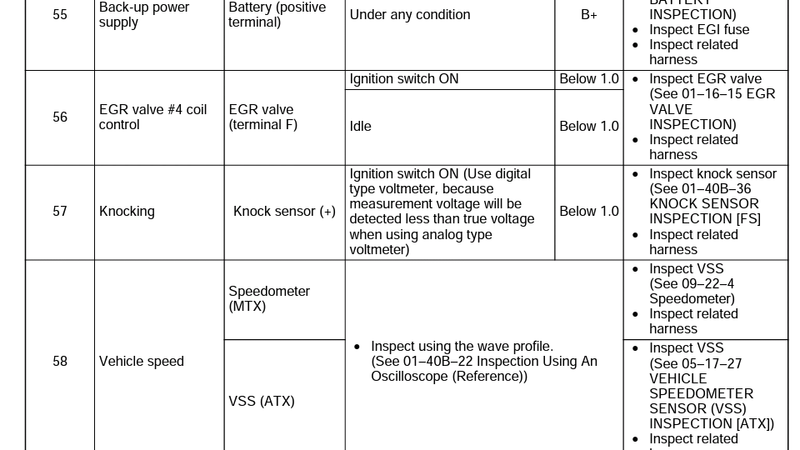 I don't want to just throw parts at it blindly, I'd like to test each sensor with the multimeter if there is a way to do so. (like the MAF, O2, etc). I also read it could be a vacuum leak. in fact, last year i had ping, and it was cause of a cracked intake tube. I changed that and went away. so maybe there's air leaking somewhere else. 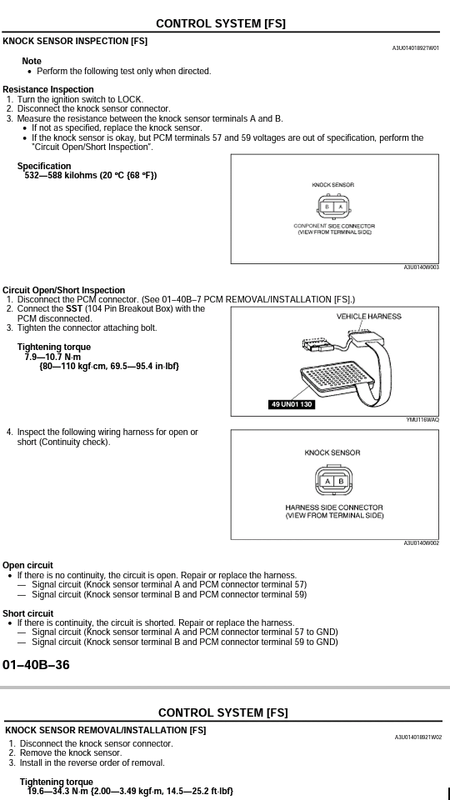 Anyone have a diagram of all the vacuum lines? I have no CEL codes (which is good because my NY inspection is due -lol), but the other day I changed the VTCS solenoid (or whatever the one on the right is-white connector) because it had a P0660 code. Not sure if it's related. I suppose putting 89 octane in it will help, but that doesn't cure the underlying problem. car only has 86k miles and there are no other symptoms at all (runs like new). changed spark plugs, wires, and coils last year. is mild pinging going to damage the engine? The problem with the knock sensor is that it can test OK but still be crap. The accelerometer is suspended in a gell type stuff that dries up and oozes out but the circuit still tests good. Many people have reported goo dripping from the sensor. Here's the test for the knock sensor. If your knock sensor is crusty and gooey then it might be smart to replace it. Last edited by pcb; 03-26-2019 at 08:27 PM. I remember playing with my knock sensor about 5 or 6 years ago. I unplugged my sensor and connecting a resistor around 550 k ohms to see what the ECU would do. It did pop a code so I figure my sensor must be giving some output. But my sensor was dripping all kinds of goo so I figure it's not performing as good as it could. Last edited by pcb; 03-26-2019 at 09:36 PM. I ordered a new knock sensor because mine looks pretty gooey. lol. I also put some Seafoam in the oil and fuel. 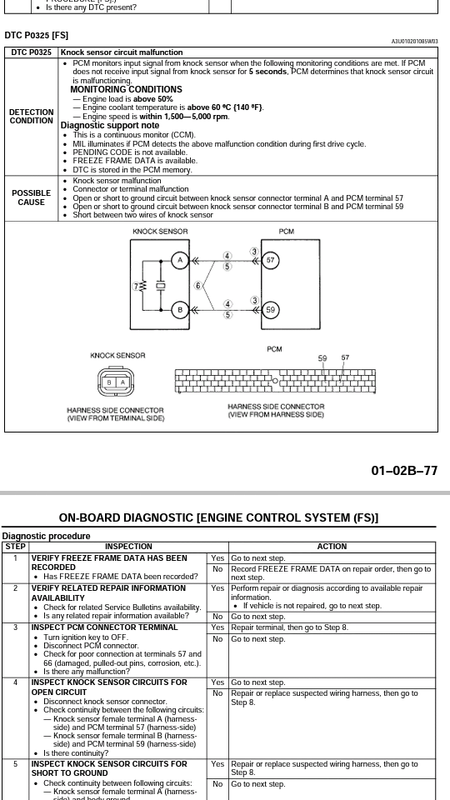 Those diagrams are very technical, but it looks like it says that if the knock sensor is bad the MIL won't illuminate unless the engine load is above 50% and it's up to temp. maybe I haven't met those conditions yet which is why i don't have any codes. now that i think about it, I was driving up a steep hill and the pinging wasn't really there. I only heard it at light throttle. so maybe the knock sensor does work. oh, this is going to be fun to figure out. . at least it's getting warm out!! BC Coilovers; AWR endlinks; GT Spec front 4 point ladder bar; GT Spec rear V-Brace; GT Spec reinforcement panel; GT Spec rear strut bar; AWR trailing arms; Modded factory rear sway bar. MP3 ECU (not flashed); Unorthodox Underdrive Pulley; JDM MS flywheel (16lbs); Stock Air Box Mod with K&N drop in panel filter; 1sty Grounding Kit; TB Coolant Bypass Mod; 03 MSP Rear Axleback; Resonator Delete. Kartboy Short Shifter with Kartboy Bushings; DGM CF Gauge Bezel; DGM CF passenger side dash cover; Wink 5 Panel Mirror; CF Shiftknob; 4 inch shifter extension; Red Accent Lights; Super Bright LED's in the Gauge Cluster. Using a scope or reading live data and knock counts is the only way to see what th eknock sensor is really doing. I know on a lot of cars, if the knock sensor is bad, it will give a default of 13 counts (just using an arbitrary number) to prevent the computer from advancing timing too much. A failed knock sensor will hurt engine performance (due to retarded timing) and probably get worse fuel mileage, but it won't "Cause" pinging/knocking/preignition. Spark plugs, cleaning the injectors, throttle body, etc. will usually cure the preignition, as long as it isn't being caused by an intake leak or something of the sort. This is hands down the best stuff on the market for cleaning fuel injectors. You just hook a can up to the fuel rail, remove the fuel pump relay so the fuel pump is disabled, and start the car. The car runs of of the cleaner for around 15 minutes and dies when the can is empty. Then just hook the fuel line back up, plug in the relay, and go. Seafoam, BG, or no other detergents on the market can come even close to comparing with how well this stuff works. There is a tool kit that you screw the can into, that comes with all of the attachments to use the can. Ive had cars come in pinging, stumbling, barely running at all. Run a couple cans of the Toyota stuff through them, and they purr like a kitten and run like new afterwards. hmmm...I'm intrigued. I might just try this stuff. It wont blow up my car since its a Mazda will it? It's just detergents, i've used it in all sorts of cars. 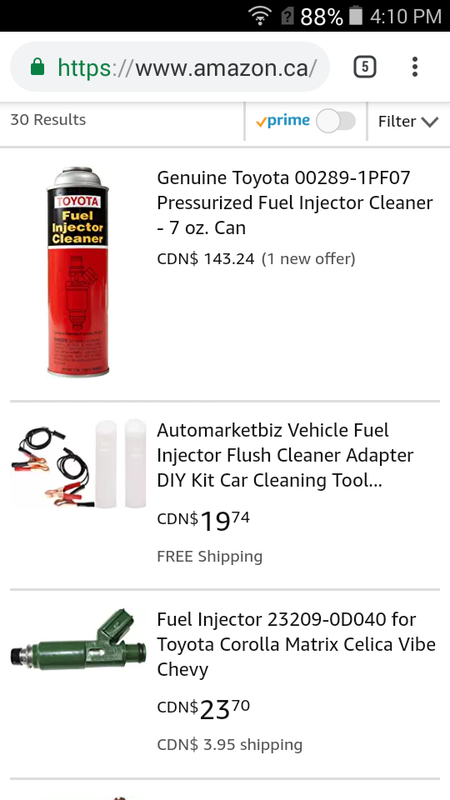 I don't know what our fuel fitting looks like because i've never messed with it on my car, but the tool comes with a variety of different screw-on and clip-in fittings for the fuel rail. OTC makes the parts for Toyota, i'm sure they have a more "universal" kit to cover all the other different fittings. This is hands down the best stuff on the market for cleaning fuel injectors. I might consider it for $20-$30 CAD especially if you just need a few drops compared to Seafoam but I'm not spending $143 a can for it. Try your local dealership, they should carry it. IT may not ship international because it's a pressurized can of chemicals. Can I get it in a can that has a screw on lid ? Is it safe to add to your gas or engine oil ?